"This chicken curry is very easy to prepare, and tastes just like the curries you order at Thai restaurants. As an added bonus -- you can make it all in one pot, so it's easy to clean up afterwards." Over medium heat, whisk coconut milk and curry paste together in a large saucepan. Simmer for 5 minutes. 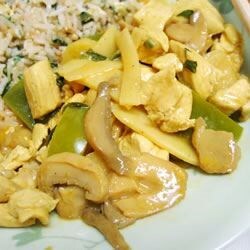 Stir in chicken broth, water chestnuts, bamboo shoots, bell pepper, mushrooms, and chicken. Season with fish sauce and basil. Simmer for 10 more minutes, or until chicken is cooked, yet still tender. We enjoyed this. I took another reviewers advice and put in pineapple which was good addition. It complimented the spicy. Will make again.